About a year ago or so, I started realizing that my trees were … a bit simplistic. Just floating around in space, and backgrounds might just be a thing I needed. So, quietly, I started trying out some physical media beyond just sketchbooks for sketching trees. 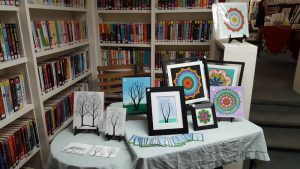 Then, this spring, I discovered the Residents Association was doing an art and wine show at the library for a fundraiser, and decided to show my work. Originally, it was just to show, no sales, but then they did get a permit for onsite sales and suddenly I needed to get a business license and set up in the sales tax system for the state. This was the moment I’d been putting off for years and here it was. I spent some time scrambling to get prints of my work from RedBubble and Zazzle, while also scrambling to make originals and do the hardest part – pricing. Side note: seeing the difference in quality of prints, I can only recommend RedBubble if you want prints of my work. Maybe it’s just the kind of thing I was getting printed, but the Zazzle prints were fuzzy and I didn’t even put them out. At the show itself, I got to walk around some and look at everyone else’s work and that was briefly terrifying, but I set up anyway and thus the show was a success! I mean, that was the definition of success for this: get business license and set up for sales tax, show up to show with art and put it out there. I did end up selling three pieces and that was extra bonus! If you see something in that photo that you like, contact me for prices. Note: the small framed mandala has already sold. This entry was posted in About the Me, Products and tagged art show, new product, originals. Bookmark the permalink.